Serco’s High Volume Low Speed (HVLS) fan series is designed to provide facilities with an energy-efficient and cost-effective cooling and heating solution. 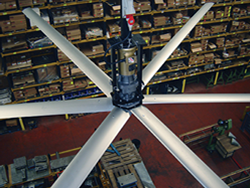 High Volume Low Speed fans move large volumes of air at low speeds over very large areas. The fan blades produce a massive column of air that flows down to the floor and outward in all directions, creating a deep horizontal floor jet that ultimately circulates air up vertically and gets drawn back through the top of the fan.